Military divers have raised two American Second World War Sherman tanks from the bottom of the Barents Sea. 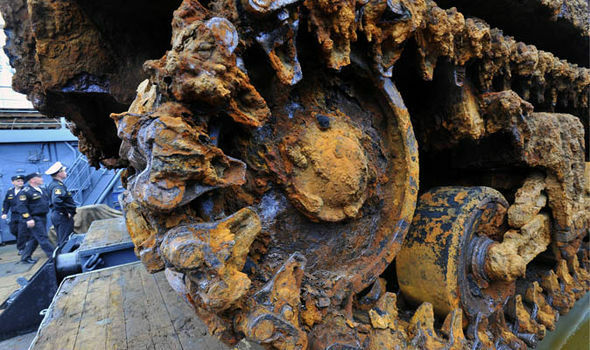 The American war machines were discovered on the bottom of the sea in north-western Russia having been on board the Thomas Donaldson, an American merchant ship that sank on 20th March 1945. The Thomas Donaldson was the 20th ship in a convoy entering the Kola Inlet of the Barents Sea. She was hit at 1.15pm on the starboard side by one torpedo about 20 miles from the mouth of the inlet. The torpedo struck the engine room, killed one officer and two crewmen on watch below and destroyed the engines. The master Robert Headden ordered the crew of eight officers, 34 crewmen and 27 armed guards to abandon ship after 10 minutes. Most left in the two port lifeboats and a raft and were picked up by British ships also in the convoy, the HMS Bamborough Castle, while others jumped overboard and were picked up by HMS Oxlip. One man died after being rescued. The master and eight crew members remained aboard and were later rescued by the HMS Honeysuckle, which towed the stricken ship towards Kola Inlet. At 4.30pm a Soviet tug took over the tow but the Thomas Donaldson sank stern-first at 5.45pm, just half a mile from the nearest dry land, Kilden Island. Divers took more than a week clearing debris from the deck of the Thomas Donaldson 164 feet underwater to get to the tanks. Some of the work was done by remote-control submarines. Commander of the Russian Navy’s Northern Fleet Vice Admiral Nikolai Evmenov said the operation would lift some other large and armoured vehicles from the wreck before leaving.